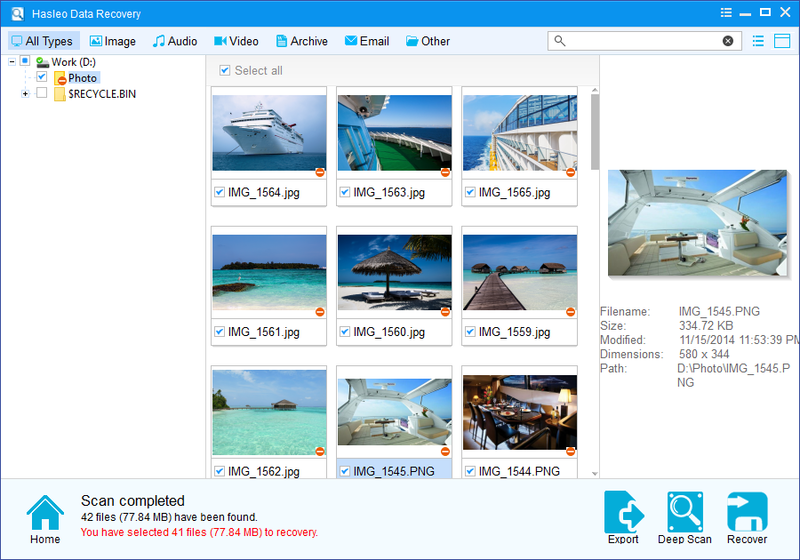 As all-in-one data recovery software, you can use Deleted File Recovery & Deep Scan Recovery features to recover lost files from a non-encrypted device. If the device you want to recovery data from is encrypted with BitLocker Drive Encryption, then you should try our BitLocker Data Recovery software which called Hasleo Data Recovery. Hasleo Data Recovery is definitely an advanced featured tool to recover deleted/lost files from a BitLocker Encrypted Drive in Windows. With it, you can not only recover deleted file from a BitLocker Encrypted FAT32, exFAT and NTFS partition, but also recover lost files from a healthy, inaccessible, formatted, failed, damaged, corrupted, deleted or lost Windows BitLocker encrypted drive. 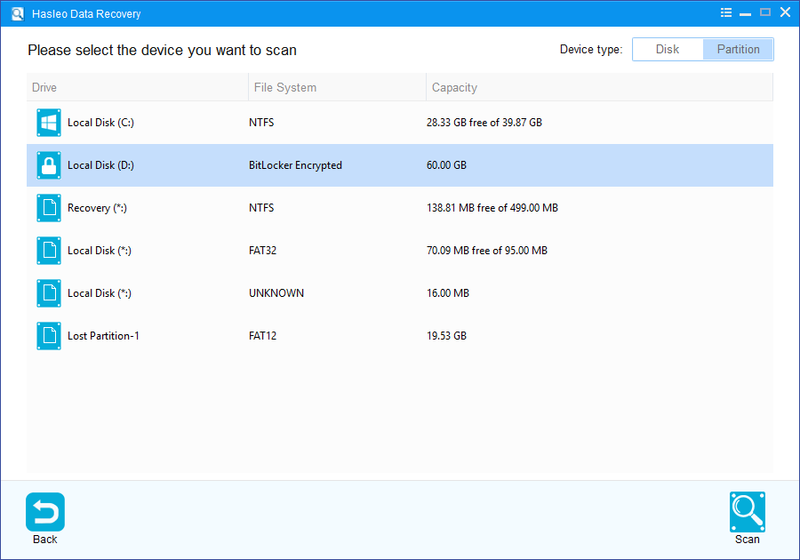 User Guide: How to Recover Deleted/Lost Files From BitLocker Encrypted Drive with Hasleo Data Recovery? Launch Hasleo Data Recovery and select BitLocker Data Recovery mode. 1. 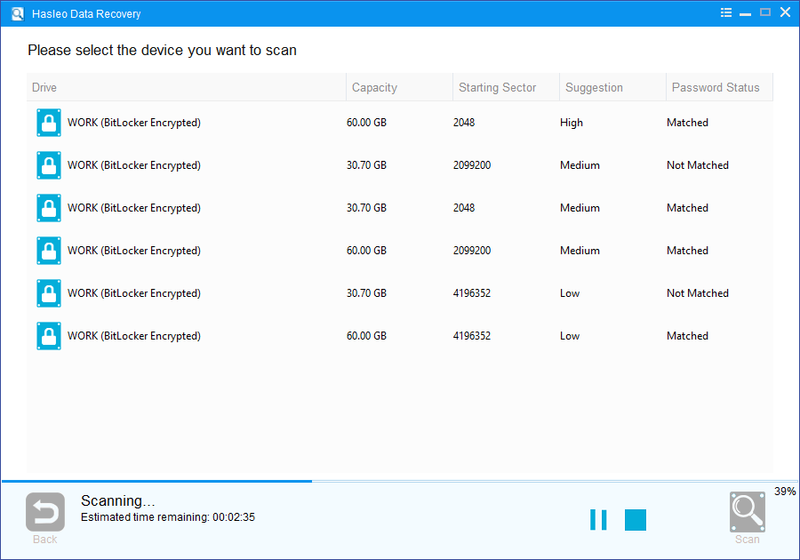 Please select the hard disk or partition where you lose your files, then click "Scan" button to find all BitLocker encrypted partitions on the device. 2. Hasleo Data Recovery will list all found BitLocker encrypted partitions on the target device. 3. Double click the BitLocker encrypted partition you want to recovery data from, a pop-up window will appear asking you to enter the BitLocker password or 48-digit BitLocker recovery key. Enter the password or 48-digit recovery key and then click "OK" button, if the password or key matches, Hasleo Data Recovery will start scanning lost files. When the scanning process gets finished, you can filter and preview found files by path and file types. When you locate the files you want, just select them and click on "Recover" button to save them to your hard drive or other storage device. If some files are not found, please click "Deep Scan" button to start the Deep Scan Recovery process, deep scan takes more time, but can find much more lost files. 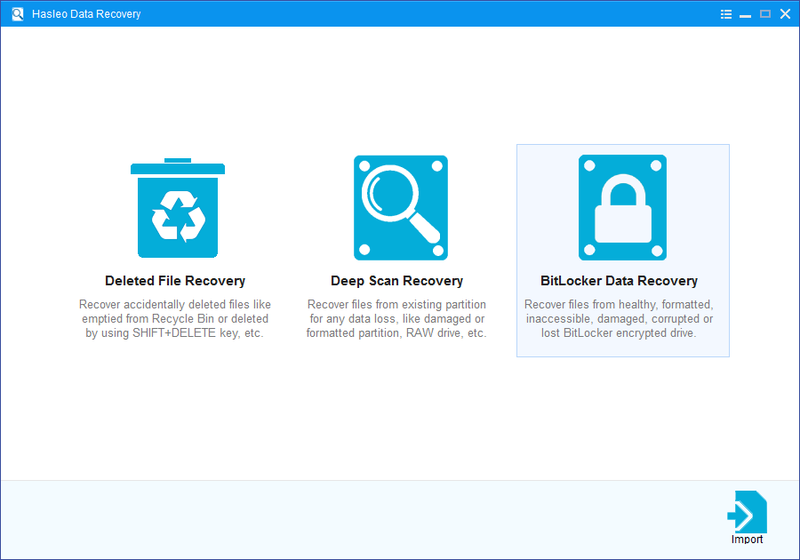 To sum up, Hasleo BitLocker Data Recovery is a professional BitLocker data recovery software that can help you recover deleted/lost files from a BitLocker encrypted partition in a few steps. 1. 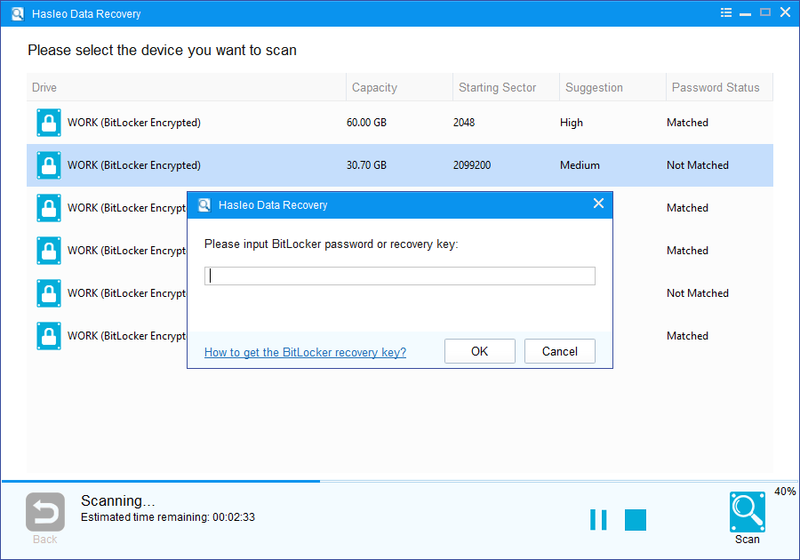 You must enter the correct Bitlocker password or the 48-digits Bitlocker recovery key to successfully recover data from a BitLocker encrypted drive. 2. If the metadata area of a BitLocker encrypted drive is severely corrupted, you will not be able to recover data from this partition even if you have the correct Bitlocker password or the 48-digits Bitlocker recovery key. 3. Don't save the recovered files to the partition where your lost files originally located. This prevents your data from geting overwriten. How to recover data from Bitlocker encrypted partition in Windows 10? How to recover deleted/lost files from BitLocker To Go encrypted USB drive? How to recover data from Bitlocker encrypted drive with BitLocker data recovery WinPE bootable disk/CD/USB? How to Fix 'Drive is not accessible. The parameter is incorrect' on BitLocker drive in Windows 10/8/7? How to recover lost data after you lose or forget your BitLocker password? How to repair BitLocker Encrypted Drive in Windows 10/8/7?